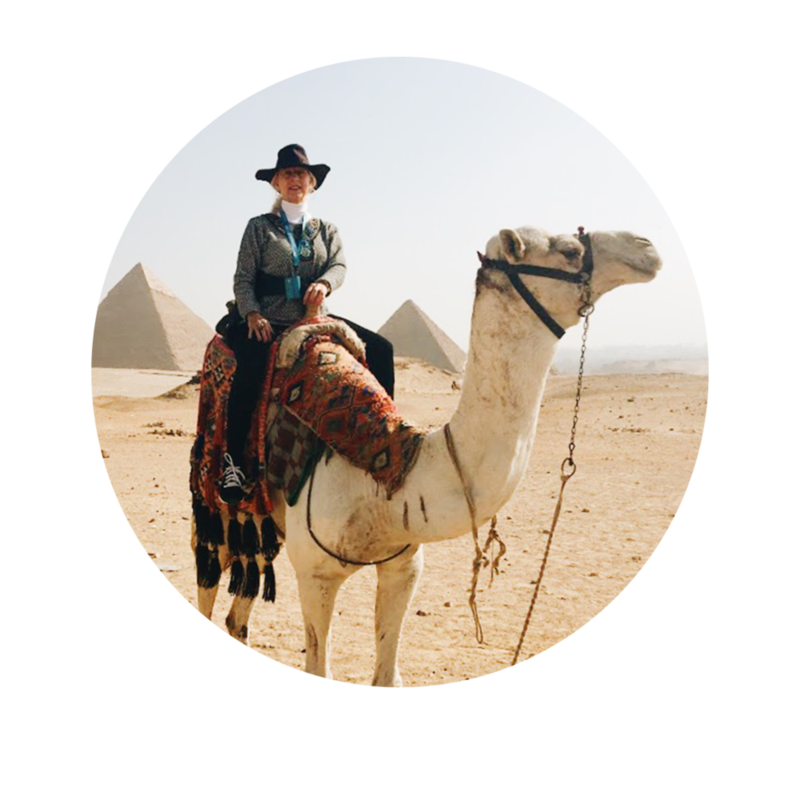 This final blog completes my must-see sights in Egypt for the solo traveler series. Hang in there; I know this topic is longer than most but each suggestion comes highly recommended. Click here to Read Part 1 and Part 2! I was astounded when I reached the temples of Abu Simbel located on Lake Nasser near the Egyptian Sudanese border. Originally, Ramesses II, the most prolific Pharaonic builder, constructed these two temples to glorify the Egyptian religion with the larger temple being dedicated to three Egyptian deities as well as himself. The smaller temple was dedicated to Ramesses II’s most important wife, Nefertari. One of the architectural aspects that make these two structures so unique is that they were originally carved into a hillside instead of being built as freestanding temples, a highly unusual design for 12th century B.C. With the four enormous Ramesses II statutes measuring 70 feet high flanking the entrance, the large temple was created to impress and intimidate the Nubians who controlled the vast Egyptian gold deposits and the lucrative, African trade routes coming from Sudan. Both temples share the same interior layout only differing in size. The interior walls of the large temple are decorated with powerful battle scenes depicting Egyptian victories against Libyan and Nubian tribesmen. The smaller temple, the Queen’s temple, possesses scenes of offerings to Hathor, the Egyptian goddess of women. Something totally unique to this temple is that the statue of Ramesses II and the statue of Nefertari are exactly the same size, signifying the equality of power shared by these two Egyptian royals. Besides the two temples’ majestic design, a hard to believe fact surrounds their existence. Due to the construction of the Aswan Dam both of these temples had to be deconstructed and moved 260 kilometers from their original site to keep them from being destroyed by water. The moving and reassembly of these sacred structures was one of the most difficult archeological, engineering projects ever done by modern man. When you visit Abu Simbel you find it incomprehensible this was actually done. The end result is cherished, historic monuments that are now preserved for mankind’s enjoyment for ages to come. This site is not to be missed when traveling to Egypt. The Valley of the Kings is located on the Nile’s west bank opposite the city of Luxor. Known as the “Royal Necropolis,” this area is the location of 63 Pharaonic and noble citizen tomb chambers constructed between the 16th-11th century B.C. Since the discovery of the first tomb in the late 18th century, the Valley of the Kings has been a treasure trove of information and artifacts for Egyptologists and archaeologists alike. The most significant find was the royal tomb of King Tutankhamun discovered in 1922 by the famed Egyptologist Howard Carter. The contents of King Tut’s burial chamber were extraordinary since most of the other excavated tombs had been raided and robbed leaving only the wall coverings and tombs’ construction to study and decipher. An ornate royal throne, an "out of this world” deathbed, a gold chariot, sarcophaguses, solar boats, funerary statues plus alabaster perfume bottles and canopic entrail jars are examples of King Tut’s treasures found in this lavish tomb. Over 5000 tomb artifacts are now housed and can be seen in the Egyptian Museum in Cairo. You enter the tomb’s chambers through a narrow, inclined passageway. On the interior walls and ceilings are highly graphic pictorial scenes, thought-provoking hieroglyphics and an overwhelming amount of carvings, especially, the fabulous cartouches all done to “create magical spells to assist the Pharaoh in finding his way safely to the afterlife.” To date, no other tomb discovered surpasses that of King Tutankhamun’s. Located in Deir el-Bahri near the Valley of the Kings is Queen Hatshepsut’s elegant mortuary temple that is heralded as Ancient Egypt’s most beautiful temple. Queen Hatshepsut was one of Egypt’s most interesting royals. She is often described as history’s first great woman. Queen Hatshepsut assumed the role of regency ruler after husband Thutmose II died early in their marriage leaving her without a son to inherit the throne. Her husband had a son, Thutmose III, by a lesser wife, whom Queen Hatshepsut guided before his eligibility to become Pharaoh. During her 20-year reign she built many great monuments. One of the most interesting facts about her life was she crowned herself Pharaoh. She was Egypt’s only woman king who assumed deity status, a move she made to stave off her stepson’s ascendency to the throne. With all of her power, oddly in the 20th year of her reign she vanished suddenly never to be found or buried in her monumental temple. The mystery surrounding her death has never been solved. The Hatshepsut Temple is utterly stunning in its size and architectural simplicity. The beautiful statues of her depicted as a man are a powerful statement to who she was and the image she wanted to portray. Inside her temple are many interesting paintings and carvings celebrating her rule. Also, on the upper left side is a charming, small chapel dedicated to Hathor, goddess of women and fertility. Hatshepsut was one of Egypt’s most powerful Pharaohs and her temple is a statement to her historic place in Egyptian history. On the day our group visited the Valley of the Kings we were taken on a side tour of an alabaster factory. We learned alabaster is a translucent rock made of gypsum that the Ancient Egyptians used for a variety of functional indoor purposes as well as for works of art. Most of the alabaster quarries and numerous working factories that employ the artisans who create gorgeous handmade objects are located near Luxor. Our group was first introduced to the importance of alabaster in Ancient Egyptian culture when we toured the Egyptian Museum in Cairo where we viewed many items made of this marble-like material. Statues, royal perfume bottles, canopic funerary jars, sarcophaguses as well as cups, bowls and jewelry were carved out of this rich looking material. We lingered in the shop for over an hour, listening to the shop owner’s stories about alabaster’s history and important facts on how to distinguish an authentic handmade, alabaster object from an artificial one. In addition we watched the artisans perform their craft and shopped through the literally hundreds of beautiful alabaster items. I ended up purchasing an attractive, long necklace of white alabaster scarabs of various sizes strung together by a gold chain, very Egyptian and very chic! A little tip: prices will be somewhat cheaper at the factory than at a retail shop or market. The Temple of Hathor is part of a Greco-Roman temple complex located in Dendera. This temple is one of the best-preserved, least visited temples in Upper Egypt. Buried in sand until it was uncovered in the 19th century, its grand size and colorful interiors are incredibly moving. Made of sandstone some 4,000 years ago, this temple is dedicated to Hathor, the goddess of love, fertility and the creative arts. These are tall, massive, highly decorated columns capped by the head of Hathor, who resembles a woman with cow ears, set the temple’s theme, the worship of the “divine feminine.” Many stories of love, fertility and the relation of man to the creative arts completely cover the temple’s walls, columns and the ceilings. You can hardly believe your eyes because the artistry is so prolific in the Temple of Hathor. Additionally, the Dendera complex houses a small temple that is dedicated to astronomy and the astrological sciences. The first Zodiac map of the heavens was created here depicting the stars and constellations and the Ptolemaic Egyptians’ “otherworldly” astrological beliefs. Also, the carvings on the outer walls of the Dendera temples are important. The only known relief of Cleopatra and her son Caesarion is depicted on one of the outside temple walls. It is said that “divine feminine” energy resides in this temple created to stimulate the senses through sexuality and the arts. I have to agree this place is unforgettable. One can only visit the Temple of Philae via boat. The temple was originally located on Philae Island but like Abu Simbel, due to the flooding produced by the construction of the Aswan dam, it had to be moved five hundred meters from its original site to Agilika Island. The Temple of Philae is dedicated to Isis, the most powerful Egyptian female goddess and is referred to as the Temple of Love. Similar to other major temple complexes, this one was added onto by numerous Pharaohs and is large with many outstanding features. An open courtyard, a hypostyle hall with huge columns possessing one of a kind column caps, massive pylons, inner chambers and a chapel are the main buildings. One of the most unique aspects of the Temple of Philae is it was the center of Egyptian alchemy, the practice of the magic arts. Goddess Isis was said to have had magical powers. Physical and intellectual transformational processes were studied and practiced here. Another unique archeological aspect of this temple is the first Christian cross was carved on one of this pagan, sacred site’s walls. The Temple of Philae served as one of the earliest Egyptian Christian Coptic places of worship and remained that way until the seventh century when the Byzantine Emperor Justinian took power. As I shared at the beginning of this three-part blog post, my trip to Egypt was personally transformational. Seeing all of the magnificent buildings and artifacts of the Ancient Egyptian culture has made me ask some highly thought provoking and somewhat disturbing questions. One of my regrets is that I didn’t do more extensive research into this fantastic period of world history before I traveled there which would have enabled me to appreciate and absorb more of what I was seeing. Hence an Egypt travel tip: familiarize yourself as much as possible with its ancient history, beliefs and culture before you leave home! The lingering mysteries surrounding the Ancient Egyptian culture continue to make Egypt one of the most fascinating travel destinations on Earth. Enjoy this somewhat long, highly informative last video, “ A Journey Down the Nile,” showcasing the marvels of Ancient Egypt. Prepare to be enchanted! I would love to hear if any of you have been to Egypt and experienced the wonders of the country. Comment below to let me know!